Dimensions (HxWxD): 1.75" x .85" x .4"
This gorgeous, 1.75 inch tall Oval Espiritu Santo Rutilated Amethyst Pendant boasts a beautiful Filigree Bale, is set in sterling silver, and weighing approximately .42 ounce, exclusive of chain, has a lovely inner landscape featuring a generous helping of titanium needles, or rutile. 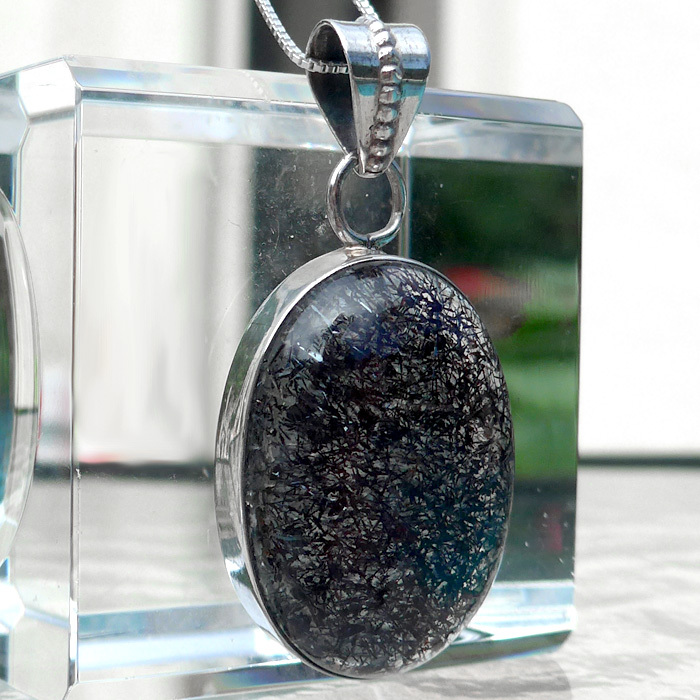 You can also see the chunky cube shaped inclusions that indicated the presence of hematite. Espiritu Santo Rutilated Amethyst is an extremely rare form of amethyst crystal that comes from the Espiritu Santo region of Brazil, and contains within it up to seven different minerals: Amethyst, Cacoxenite, Goethite, Clear Quartz, Lepidocrosite, Smokey Quartz and Rutile. The stone exhibits enough clarity to be extremely translucent when held near any light source -- more clarity than many Espiritu Santo Rutilated Amethyst crystals, which often are opaque unless held directly up to the light. We consider Espiritu Santo Rutilated Amethyst to be remarkable because it has the unique ability to simultaneously connect us to Higher Worlds and ground us firmly in physical reality. Espiritu Santo Rutilated Amethyst is one of the world's premier ascension stones, valued for its ability to ground the bearer while connecting them to Divine Source. Espiritu Santo Rutilated Amethyst is one of the world's most valued stones of protection, which we have recommended to Lightworkers, healers, corporate executives, nurses, doctors and others working in situations with very conflicted or afflicted energy fields for many years. Espiritu Santo Rutilated Amethyst energizes the aura, and the very best protection from unwanted or negative energies in our environment is always to strengthen the auric field. Espiritu Santo Rutilated Amethyst resonates with the energy signature of the violet flame of St. Germain. 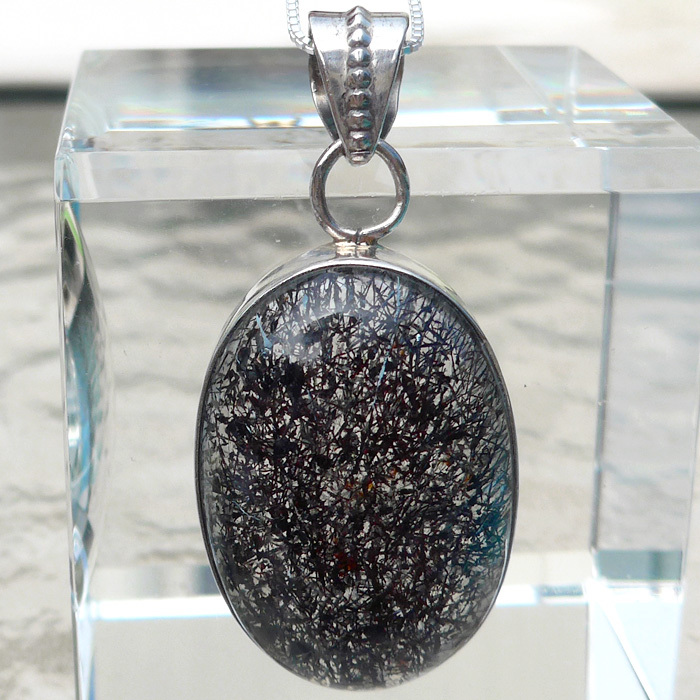 This unique pendant is both a valuable collector's item, because of the rarity of the crystal, and a highly desirable spiritual tool, useful to meditators, crystal healers and Lightworkers in general. This Espiritu Santo Rutilated Amethyst pendant is crowned with a handsome bale & would be suitable for a man or a woman. This Espiritu Santo Rutilated Amethyst Pendant comes complete with a sterling silver chain in its own jewelry box. Read about the metaphysical and mineralogical properties of all seven minerals found in Espiritu Santo Rutilated Amethyst in our Crystalpedia. Above weight is shipping weight including jewelry box. Net Weight is .42 oz., or 12.7 grams without the chain.